Bethany Surf Shop’s Outlet location is open seasonally from Memorial Day to Labor Day where you will find discounted prices for men and women’s surf apparel, sandals, accessories, Bethany Surf Shop t-shirts, sweatshirts, and much more! Located in Ocean View, Delaware just a mile from our downtown shop on the Bethany Beach boardwalk. 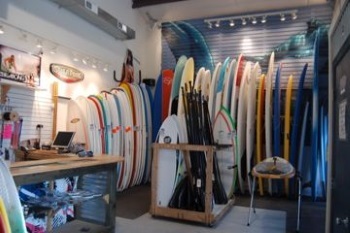 We also provide one of Delaware's largest selections of new and used stand up paddle boards and accessories. Not looking to purchase a stand up paddle board? Sign-up for a lesson or canal tour of Delaware's beautiful inland waterways. 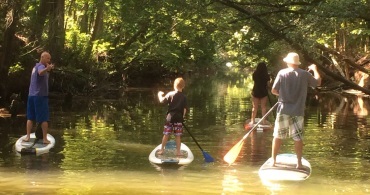 Be sure to demo the stand up paddle boards before you buy! All of our demos are done in the calm waters behind our Outlet Location. Looking for something new? Try a Delaware Paddle Board Tour! Bethany Surf Shop Skim Jam! Join us Monday nights, during the summer months, from 6-7 on main beach in Bethany in the summer to demo skim and body boards and get some tips from Pro-riders, Bill Baxter and Colin Herlihy!!!!! We will be celebrating 19years olf skim jams next summer! ©2019 Bethany Surf Shop. All Rights Reserved.